A raw natural diet is a combination of fresh whole foods consisting of chunks or ground raw meat, raw bones, vegetables and fruits. These foods are supposed to be fed to our animals in their raw (un-cooked) natural (un-altered) state. For a lot of you the idea of feeding your beloved dog or cat raw meat and raw bones seems strange, especially chicken bones. Many of us remember growing up being told that you never ever give a dog or cat chicken bones! It is time to dispel some of the “old” myths. 1. Veterinarians, Scientists and Archeologists agree that although altered in outward appearance, today’s dogs and cats internal workings are fundamentally the same as their wild counterparts and ancestors. 2. 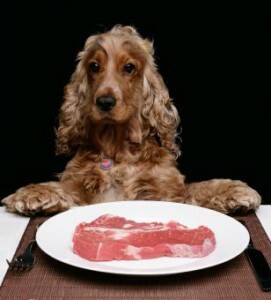 Dogs are classified as an OMNIVORE. That means that your dog needs a wide range of food in their diet including raw meats (including organs and fats), raw bones, fruits and vegetables. 3. Cats are classified as a CARNIVORE. That means that your cat needs raw meat including the muscle, organs, stomach contents, fats and bones. 5. Dogs and cats do not have digestive enzymes in their saliva. Their saliva is designed to lubricate large chunks of food for easy travel to the stomach. Due to the lack of digestive enzymes in their saliva, these enzymes MUST be present in their food. These vital enzymes are only present in raw unaltered, uncooked food. ANY HEAT PROCESSING KILLS THESE VITAL ENZYMES AND TAXES THE ANIMALS PANCREAS, DIGESTIVE AND IMMUNE SYSTEM! 6. Dogs and cats have a single chambered stomach, similar to human beings. However their intestines are half the length of ours and their stomach acidity content is lower than ours. This acid along with other digestive enzymes are what break down the food matter so that the life sustaining nutrients can be absorbed. This acidity level is also why your dogs and cats can eat raw meat and raw bones, with little to no risk of parasitic disease. 7.Dogs and cats intestinal walls are a host to hundreds (400) of species of bacteria and microorganisms, called MICRO FLORA. The natural balance of your animals micro flora provide enzymes, vitamins, minerals and helps to inhibit the growth of disease forming bacteria, such as Salmonella and E-coli. So why choose a raw diet over a cooked dry/canned diet? 1.Dogs and cats anatomical and digestive functions demonstrate how they are pre-destined to eat a “species appropriate” diet of raw meat, bones, veggies and fruits for optimal health. 2.Nothing can replace the nutrient value of fresh whole raw foods going into the body. Today’s cooked kibble/canned pet diets are made of poor to low quality foods. Even the better quality kibble/canned products using grade “A” and hormone free foods, loose virtually all of the vital nutrients (enzymes and antioxidants) during the cooking process. Even attempts by some of the manufacturers to add back some of the nutrient content in the form of supplements after the food has cooled still falls far short of the nutritional needs of our furkids. 3.The steady and increasing onslaught of degenerative disease in our dogs and cats has forced us to question and examine the quality of the foods being used and how they are processed in relation to our pets overall health picture.